At A to Z Eyecare, our mission is to provide our community with quality vision care through education, technology, and excellent service. A big part of that mission has to do with safety. That’s why we’ve recently become concerned with a trend in eyewear that has been catching on, particularly in young people – over the counter contact lens use. Over the counter contacts are usually intended for aesthetic, rather than corrective, purposes, and can change blue eyes to brown eyes, green to red, or even be designed to look like cats or sports team logos. These seemingly benign alterations, however, carry hidden dangers – the FDA warns that nonprescription contacts carry with them major risks for blindness and eye injuries. The problem with OTC contacts is that they aren’t regulated – sold at some beauty salons, flea markets, and websites, there’s no way for the consumer to know how they were made, what they were made with, or how they’ve been cared for prior to using them. These variables equate to big risks for ocular health. 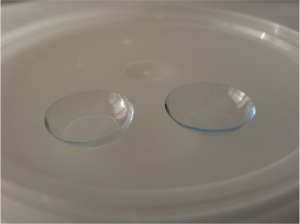 Contacts that aren’t properly prescribed or cared for can lead to allergic reactions, corneal scrapes, corneal ulcers, and bacterial infections, all of which can eventually end in blindness. It’s not that non-corrective lenses are inherently dangerous. If you want to use contact lenses to color your eyes orange or truly be the most dedicated fan at your next sporting event, you can – just please go to a licensed professional to get them. Don’t run the risk of losing your sight. If you’d like to discuss your eye care options, just hit the “Make An Appointment” button at the top of this page – that’ll take you to our convenient online submission form. If you have any other questions, feel free to contact us at our Arcata, CA office. Don’t forget to check back to this blog regularly – we’ll be updating it with news and insights from the wonderful world of eyes.